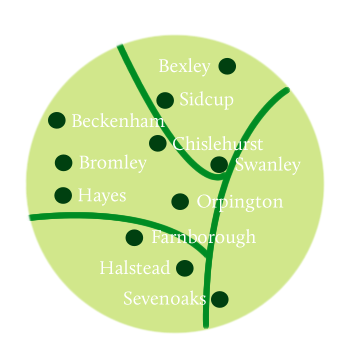 Our base in Orpington enables us to work anywhere across Kent and the outskirts of London. Our central heating and bathroom fitters provide a comprehensive range of bathroom installation, bathroom design, new central heating systems and new shower installation services to homeowners throughout the region, including Sidcup. We have a few testimonials below, from just some of our satisfied Sidcup clients. “Thanks ever so for the splendid job on our wet room, we hadn’t had one before but it seemed such a good way to open the room up and your design service helped us picture it more clearly. “I had to write and say a huge thanks to you all for the new bathroom; it’s just gorgeous, like bathing in a fancy hotel rather than my tiny upstairs bathroom! I love the colours and thanks so much for all the advice on the suite which is really perfect and somehow makes it seem that bit more spacious inside.